"Charlie's Garden Journal" is a weekly program hosted by horticulturalist Charlie Nardozzi. 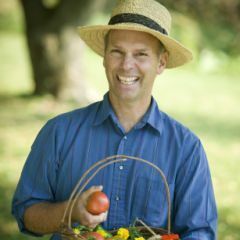 Charlie is a nationally recognized garden writer, consultant, and speaker. He was the senior horticulturist for the National Gardening Association, and currently writes the monthly Edible Landscaping e-newsletter. Each week, Charlie focuses on a topic that's relevant to both new and experienced gardeners. From lawns and lilacs, to giant pumpkins, perennials, and pests; Charlie Nardozzi covers a lot of ground in this series. “Charlie's Garden Journal” is suitable for all audiences. It is especially applicable to Northern areas that have similar climates as USDA zones 4-6. Nationally recognized horticulturist Charlie Nardozzi shares a brief history of Mother's Day and gives gardening gift advice. Here's a straight forward approach to planting bare root trees and shrubs. Charlie provides some helpful hints to keep them hardy. Flower varieties that are old, new, borrowed, and blue - no wedding necessary. Charlie Nardozzi suggests new tomato, bean and squash varieties to try this year. He provides brief histories and organic gardening tips.